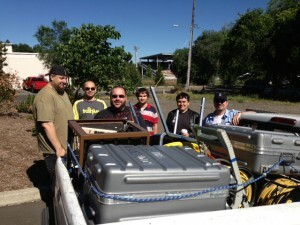 With Raider Stadium in the background Digital Media Center staffers Brandon Givens and Charles Douglas team up with EMDA students Mike Greata, Robert Cole, Parker Mills, and Zack Cochrane and a pick up full of TV gear to begin set up. RVTV has televised the SOU Commencement since 1990, and back then it took bigger trucks and loads more gear. The first Commencement televised in 1990 was edited after the fact, this year the program will be switched live with four cameras and will stream back to the DMC via the internet to televise and stream live. 2013 Commencement will televise live Saturday morning at 9am on Channels 9 and 21 GP and will repeat Satuday and Sunday nights at 6pm on both channels. A new local program, The Jeffersonian, will make it’s debut in the region. A joint venture of SOU and SOPTV, the Jeffersonian will chronicle the people and places that make are region unique. To access Commencement online just click on to our live Channel 9 stream on the RVTV website here. The ceremony will be posted online on the RVTV and SOU Commencement websites for video on demand viewing next week, and DVD copies are available for $15 ($20 if mailed) from the Digital Media Center. Just call 541-552-8416 to order.